​​An actor or actress is a whole person and must be nurtured as such. At The Linden Grove Theatre Company, we strive to provide a beautiful, protected Grove where our actors and actresses can spread their branches, unfurl their leaves, blossom in the sun. Come, put down roots in our Grove. See what sprouts when you are planted with love, encouraged to stretch, and given permission to bloom. ​Our mission is to learn, grow, play and have fun while training the theatre artistis of tomorrow! 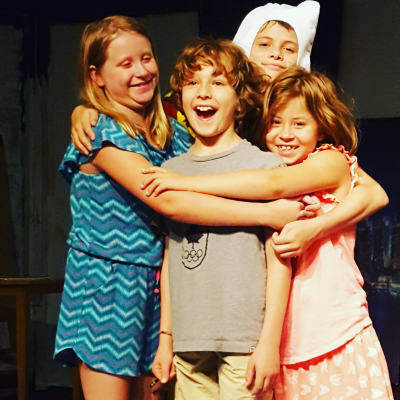 We know that theatre training develops confidence, empathy, friendships, team work, individual responsibility, problem solving, reading, and a myriad of other skills. Whether we're working on a trusty classic or an exciting new play, we know there are worlds of possibilities waiting for our actors on the stage. ​Are you a producer, director, or theatre teacher looking for your next hit show? Join us on Facebook to see photos, conversations, and more by clicking here. Theatre doesn’t last. Only in people’s memories and in their hearts. That’s the beauty and sadness of it. But that’s life: Beauty and sadness. And that is why theatre is life. So maybe it's a little sappy, but the business of working on the stage is one of trying to capture life. Trying to hold, even if only for a moment, an organic, fleeting bit of truth. Attempting to wrap one’s hands around a revelation that a playwright penned, a director sought to understand, an actress felt in her heart. A golden nugget of story we all know is true, or would be true!,or could be true! if we were the people on that stage, living that story, facing the obstacles and reveling in the joys unfolding before our eyes. And we are those people! For theatre is about us: the dreamers, the dare-ers, the doers. Theatre is about real people and the stories we live, even if only in fantasy. Theatre is about me, and it’s also about you. But mostly: It’s about what happens when we come together, open our hearts, and tell our stories. Join us in our story telling! Put down roots in our Grove and bloom in the sun!